Just the other day I was opening a can of ﻿chili to make my famous spaghetti sauce. Imagine my surprise when the can opener did a poor job and cut my finger while I was lifting the lid off. I like to think of my kitchen as a safe place, especially because I spend a couple of hours a day in it, and this was quite a disappointment. What if one of my boys has decided to open a can of salmon all by himself? Sure the cuts made by can lid are almost never serious, but that jagged edge can land you in the emergency room. Needless to say that this can opener has been sent to early retirement and that the replacement was on the way. To avoid repeating the same mistake, I did a thorough research of the requirements of a good can opener and tried out some of the best electric can openers on the market. Before we dive deeper into the characteristics of these units, here are the factors I considered. The frequency of use will have a major impact on all of your decisions regarding a can opener, especially the price. Are you willing to empty your pocket on a can opener if you are opening cans only once or twice a month? Probably not. But, if you’re like me, you use your can opener every day. In that case, you should search for a durable model you feel comfortable using regardless of its price. There are two main types of can openers: manual and electric. I prefer electric because they are completely no-fuss, but some people love the rawness of the manual openers. Besides, if designed well, manual openers are not that difficult to use as you imagine them to be. Manual can openers have been used from the dawn of time to open cans. Their biggest advantages are their size and portability, as well as the fact that they don’t need any source of energy so you can take them with you on a picnic or when camping. Furthermore, they will always work during a power outage, so it is important to have them with you in a case of some natural catastrophe or emergency. Up until recently, I have never used an electric model, and I was very curious about how it works and what makes it better or worse than its manual cousin. At the first contact, I was fascinated with the simplicity. You just push the button, the can is opened in a matter of seconds. Just needs attach the can to the machine, and the electric motor does everything for you by using pressure to remove the lid. The best thing about the electric openers is that most of them create dull edges that cannot lead to injuries. They are also much easier to handle, so I feel very comfortable even when my sons are using them. Now that we’ve got that covered it is time to dedicate more attention to the electric models and their features. 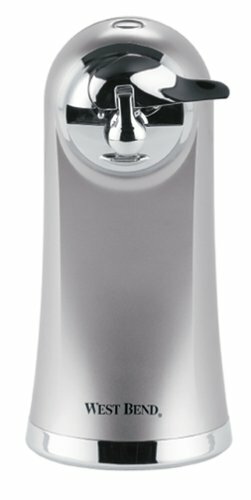 While the electric can openers are, by default, easier to use than the manual ones, there are electric models that are easier to use than others. The more powerful the motor on the electric can opener and the sharper the blade, the easier it will cut through the can. Blades made from high carbon stainless steel perform very well and stand up to many years of use. There are several different types of electric can openers. To make your decision much easier, I have prepared a short guide through all of them. Countertop openers: As its very name says, a typical countertop opener is an upright appliance attached to the countertop. 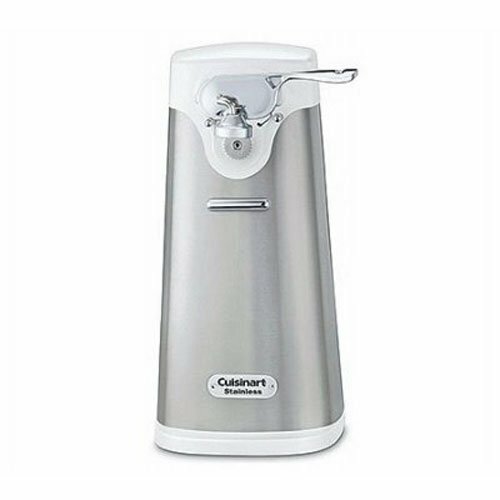 The can is placed under the blade which is pressed down on the top lever to open the can. Handheld and cordless openers: These openers offer the same portability as the manual ones, and combine it with the effortlessness of using an electrical model. Under-the-cabinet openers: These openers are permanently mounted under the kitchen ﻿cabinet. They don’t take up additional counter space, and they’re always close by when you need them. Side-cutting can openers: This is by far the safest electric can opener on the market since it cuts the can below the lid’s rim. As a result, the edge is smoother, and the chances for injuries are minimal. After my unpleasant experience, the safety of the can opener has become one of my top priorities in choosing one. The most important thing to look for is a can opener that doesn’t leave sharp edges on the can. As I have already mentioned, side-cut can openers, excel in the area of safety. This type is especially recommendable if you have kids and love when they are helping you in the kitchen. Proper cleaning of the can opener is crucial because it prolongs the device’s lifespan and prevents corrosion and rust. A rusted can opener can contaminate your food and consequently be harmful to your health. It is best to search for can openers that can be set apart and which blade can be washed properly, by hand or in a washing machine. This can opener has the highest reputation on the market. It opens cans from the side and leaves an edge that is safe to the touch both in the can and lid. Another plus: with this side opening system, the loose lid does not fall back into the can – very convenient. The process of inserting the can in the opener is straightforward and once inserted, the opening is hands-free except for holding down the power lever. I especially liked this product because one thing: it doesn’t touch the food while opening cans. The opener is super easy to use; it is solid, quality-built and designed for long time use. Sleek chrome combined with quality plastic makes this opener quite attractive. It's about 10 inches long so you can open big cans. While this is good, functionality-wise, such a large opener takes up a lot of space. The weight is around 4 pounds which give it extra stability. To be honest, this was love at first sight. Super easy to use, leaves a smooth, safer cut edge. Appearance is pleasant to the eye. This model is safe for both the youngest and the eldest, and it is very quiet while using. The plastic from which it is made appears to be of average quality, but I am not sure if it is designed for long term use. Looking on the bright side, in one sentence, Cuisinart SCO-60 is the combination of style, convenience, and power. Next, SCO-60 stands out in design and fits well into each interior (Women always think of aesthetics). It is suitable for cans of any size because of its wide base, so you do not need to worry about sliding. I’ve noticed that the opener stops when the can is completely opened, and a small magnet easily removes the lid. The best thing about this device is that you don't have to put any pressure to open the can. It comes with a one-year warranty, but I’m not sure can the appliance survive for much longer. Also, another thing that bothered me is the fact that it can cause splashes while working, and if there is anything I don’t like to see in my kitchen that is a mess. Safe, sharp and good looking. Will open every type of tall cans. 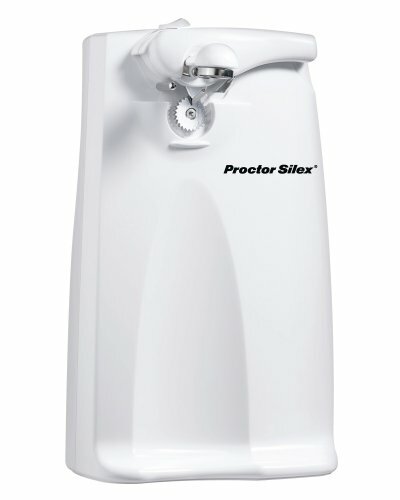 Proctor Silex Extra-Tall Can Opener will instantly attract casual users because it is inexpensive, and for the price you are asked to pay, pretty reliable. Despite it being cheap, it never fails to open a can at the first attempt. 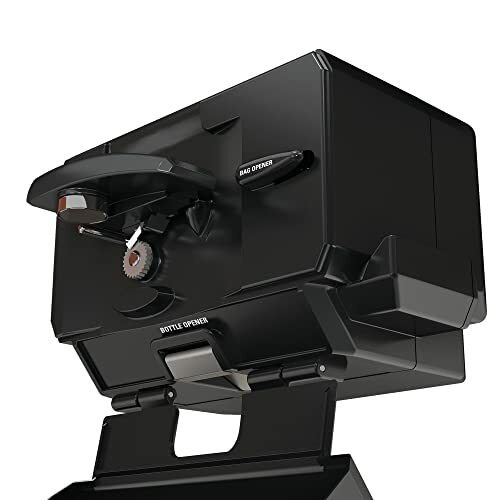 Besides, this product offers an excellent convenience by including a knife sharpener that provides additional versatility. It is located on the back of the can opener. In addition to these features, the opener has a very solid handle, with non-slip coating. It's very simple to use: you place the can above the cutting point, lower the handle and it will do the rest of the job. The removable handle will make it easier to maintain the appliance. You have to keep in mind that this opener is made of plastic, and its sustainability, as well as durability, is called into question. The blade sharpener is a very nice and useful addition. The removable handle gives the opportunity for better maintenance of the appliance. Opening large cans is a breeze. Plastic is not of the best quality. When looking for a functional and high-quality can opener, this model is somewhere on the top of everyone’s list. But does it deserve to be? Its attractive design will make you display it to a visible place in your kitchen so that you can boast about having such a beauty. But the beauty is not the only thing that this device has to stand out among others. More important than its design, is the distinguished ease of use. The machine appears like it does everything by itself. You don’t even have to hold the can and handle while it is working. West Bend’s opener simply does not stop to surprise with its characteristics. It's simple to maintain: you just need to remove the cutting tool and place it in the dishwasher. Yes, it's that easy! The engine inside it is very powerful and quiet. It also comes with a bottle opener and knife sharpener on the other side. So at the price of one, we get three quality products that are always in one place, available and ready for use. However, the appliance fails where it is the most important: after using it, I have found large metal shavings inside the can which can be quite dangerous. It takes up just a tiny bit of counter space. It is effortless to use it. It is simple to maintain and the blade is dishwasher safe. This multi-purpose tool includes a can opener, bag cutter, bottle opener, and knife sharpener. It saves space on your countertop by attaching to the underside of cabinets, which makes it a perfect fit for a small kitchen. The installation process is easy if you follow the step-by-step instructions. All of its features are hidden behind a swing-open door. By doing this, the manufacturer achieved a unique look, and made it a bit mysterious. This tool is suitable for opening cans of all sizes, even size 10. It's very easy to handle; just gently move down the cover until it’s completely open, place the can, and after opening close the cover. The cover also keeps it clean. The measurements are slightly larger about 6.5 to 7.5 to 5 inches, but multi-purpose of this device justifies the size. Everything stays hidden underneath the lid. The edges of the can remain a bit sharp after opening. Although easy, installation process requires some time. All of these units have their set of advantages and drawbacks. Although I loved West Bend’s product very much, because of its efficiency and functionality, I can’t seem to get over the safety issue, so this is not the opener granted with permanent residence in my kitchen. 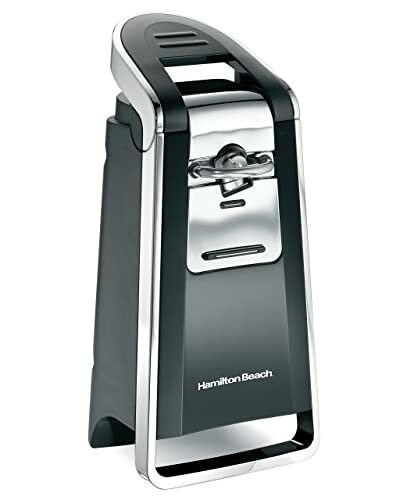 This honor belongs to Hamilton Beach Smooth Touch Can Opener because it excels where it matters the most – safety. It also does an excellent job in other areas, such as ease of use and maintenance. As for the lack of multi purpose, I always say that it is better to buy more products that do their job excellently, then buy one multi purpose product only to learn it is sloppy in most of its duties.